Since I was in the mood to quill again -- thought I'd make this quick/simple card. I cut my own paper - since I can then match up the colors perfectly with the rest of my card (and I'm to cheap to invest in quilling paper!). 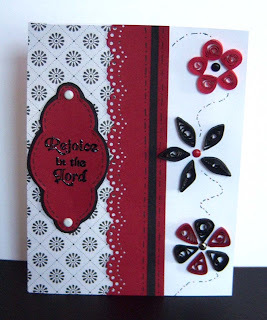 This card in reds and blacks was a lot of fun to make using some very simple shapes -- I'm just a beginner in the line of quilling, but I'm having fun learning the art. I love that Stampin Up stamp! And where did you get the shape you stamped it on? I love that shape, too!! I had a whole pile of chipboard pieces I've never used. I was sorting them to give most of them to my s-i-l, and came upon that shape. I saved it to trace off -- I usually use it horizontally, but tried it in the vertical position for this card and liked it.